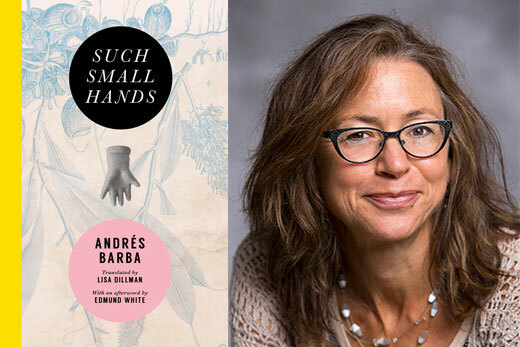 Lisa Dillman has won the Oxford-Weidenfeld Prize, which honors a book-length literary translation into English from another modern European language, for her adroit translation of a chilling, almost gothic Spanish tale set in a girls’ orphanage. “I am delighted and proud that our colleague Lisa Dillman has received another award recognizing her approach to literary translation, which is characterized by a delicate balance of technical precision and verbal artistry,” says Donald Tuten, outgoing chair of the Department of Spanish and Portuguese. Dillman discovered Barba by chance while she was browsing a Madrid bookstore a decade ago. She bought his newest book at the time, “La Hermana de Katia” (“Katia’s Sister), to prove her suspicion that the young man couldn’t successfully capture a story focused on three troubled women. Barba proved her wrong. Dillman was mesmerized by his voice and the urgency in his words. She was even more captivated when she then read “Such Small Hands,” a novella that explores the inner world of children’s minds through the story of Marina, a 7-year-old girl spared in the car crash that kills both parents. Dillman was so taken with the precision of Barba’s words and tone that she translated the book into English without a contract, the only time she had taken on such a challenge. She won the Winship Award, allowing her to take a semester off to meet with Barba in Madrid, to rework her translation and translate two of his other works. English-language publishers, though, were uninterested in “Such Small Hands” until Dillman won the Best Translated Book Award. Contest judges cited Dillman’s skill, going well beyond language to capture the tone and style that make the original so compelling. Adding to the challenge was the book’s structure, told in alternating chapters from the point of view of Marina and the other girls, who function as a Greek chorus. “As the story progresses, the tension that quickly builds between these characters owes much to the novel’s tight economy of language, and to Dillman’s ability to recast Barba’s taut sentences and disconcerting syntax in her own comparably unsettling English translation,” the judges’ citation reads. Dillman, a specialist in literary translation from Spanish and Catalan, is already at work on her next translation, Barba’s “Luminous Republic,” due next year. Though she would still like to one day translate “Katia’s Sister” and continues to work with Herrera, she also hopes the latest award will again open doors. Her goal: Translations of contemporary female authors. She has one in mind but will only say it is an Argentinian writer.